This category is to further the body of knowledge about Ernie Moross, one of the most interesting personalities of early American auto racing. Moross was Barney Oldfield's manager for a good portion of that great driver's career as well as the first general manager of the Indianapolis Motor Speedway. He owned the Moross Amusement Company and campaigned other great drivers including Bob Burman and Teddy Tetzlaff, primarily in Benz racing machines. After he retired from promoting auto races he became a communist and ran for a Michigan state senate seat. Failing at that, he also suffered a huge financial set back during the Great Depression and died penniless at age 75 in 1949. 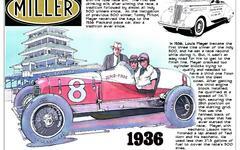 Ernie Moross (I wrote the Wikipedia entry on him) was a great personality of the early days of American auto racing. Presented here are four small obituaries that provide at least a modicum of information about the man. Although there is not a great deal of documentation readily available, I have managed to assemble here probably more information about the man than exists anywere else in one place. Promoter extraordinaire Ernie Moross wrote this April 9, 1910 Indianapolis News article opining about how race cars get named. His main point that while manufacturers and teams introduced names the monikers that stuck boiled up from newspaper reporters or fans. The attachment here contains two articles from the May 22, 1909 Indianapolis Star. The Indianapolis Motor Speedway was under construction at the time and track management was scurrying to get the facility into shape for motorcycle and auto races that summer.